Hey growers! 2017 is here and we’re really looking forward to getting back in the dirt for the coming growing season. Here in Minnesota, we have a while yet to wait on that, but there is plenty to do to gear up for the garden in the meantime, including closing out your 2016 garden and designing your 2017 garden on Tended. 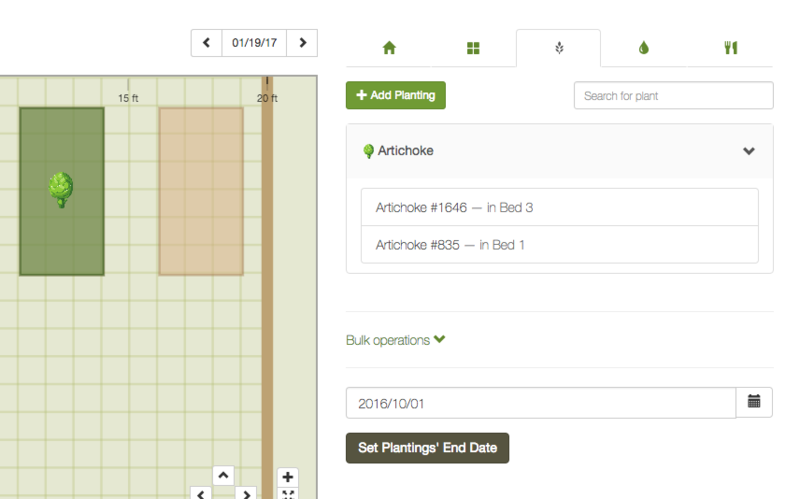 When you're in your garden's map view, go to the Plantings tab, and there’s a new bulk operations section. Expand the section, and you’ll find the option to close out all of the plantings for that space on a date of your choosing. If you have multiple spaces that make up your operation, you'll want to visit each space to take care of them. Detail-oriented folk may still prefer to set plantings’ end date on a case-by-case basis via their settings, but now you have the option of a big shortcut to reuse your existing spaces in 2017. Remember, you can always return to view your 2016 garden on a given date by using the datepicker above the map. When creating your plantings, you'll notice a new option of Multiple Rows. Instead of needing to create rows one-by-one that are identical and next to each other, you can speed up the creation process and management of actions and harvests by using the multiple-row option. This will benefit farmers and others who grow a lot of a given plant. Besides specifying the inner spacing of the plants, you can also put in the row spacing to accurately reflect your real-world operation. Give it a try! Give us feedback at support@tendedapp.com or leave a comment below.